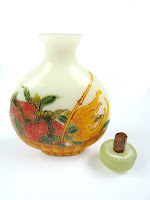 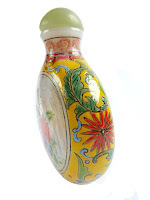 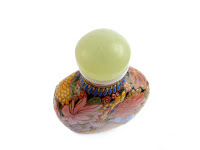 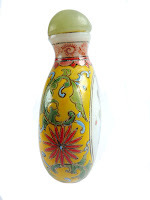 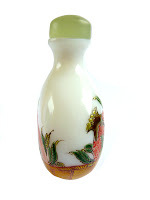 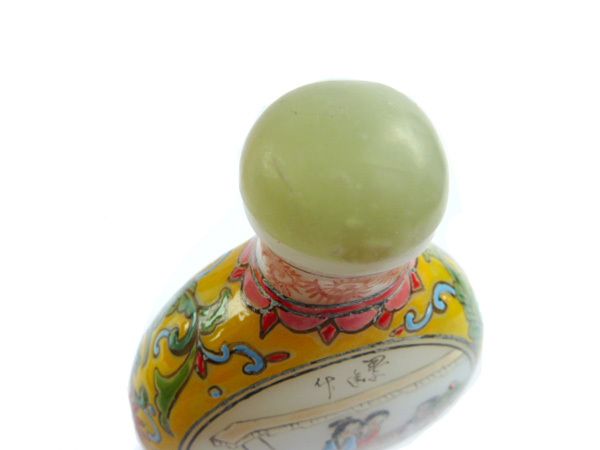 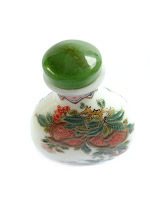 LEMON KITSCHARMS - Vintage & Retro Jewellery: GUYUEXUAN SNUFF BOTTLES FOR SALE! 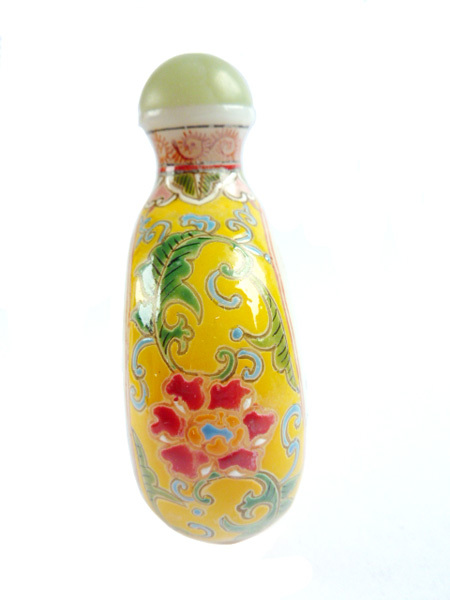 GUYUEXUAN SNUFF BOTTLES FOR SALE! 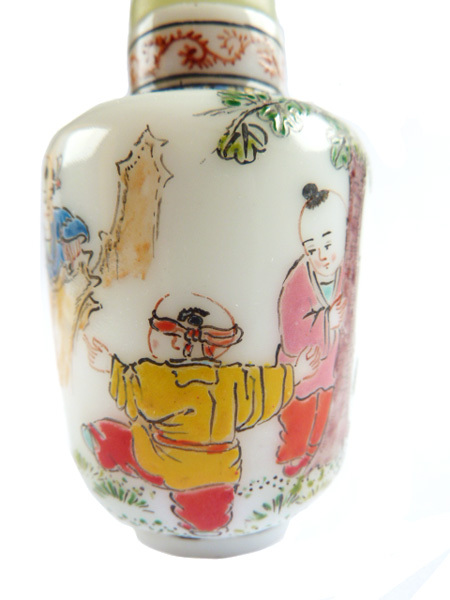 Snuff bottle collectors! 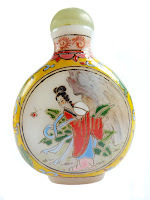 I have some genuine Guyuexuan and Qianlong Guyuexuan-style marked bottles looking for new homes, these are from an elderly private collector who wants to sell her chinese antiques & vintage bottles for retirement. 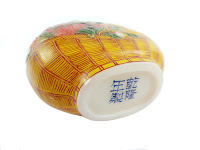 There are more chinese inside-painted knickknacks in my main shop at http://lemonkitscharms.com from the same collector. These Guyuexuan or Qianlong marks are not fakes, but I have no experience on snuff bottles and how the marks are used, so the actual age of these are unknown. 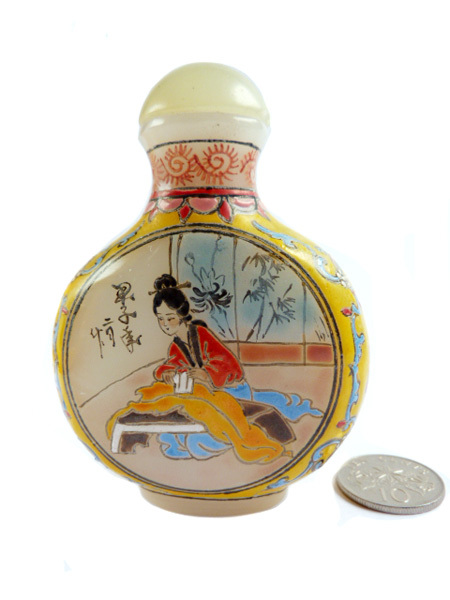 All I know is she purchased them from Beijing antiques shops back in the 1970s-1980s when China was still 'closed' and snuff bottle collecting wasn't as widespread, so I have marked them as 'Antique' (1700s-1910). 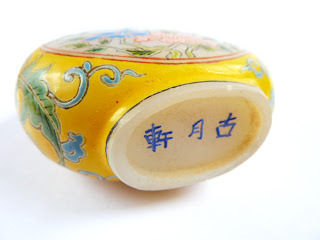 She visited China for work and unfortunately was not interested in the history of Guyuexuan, so I can't relay to you what the antique shop owner would have said; she purchased them with the impression that it was old, very high quality and small enough to sneak into her luggage. 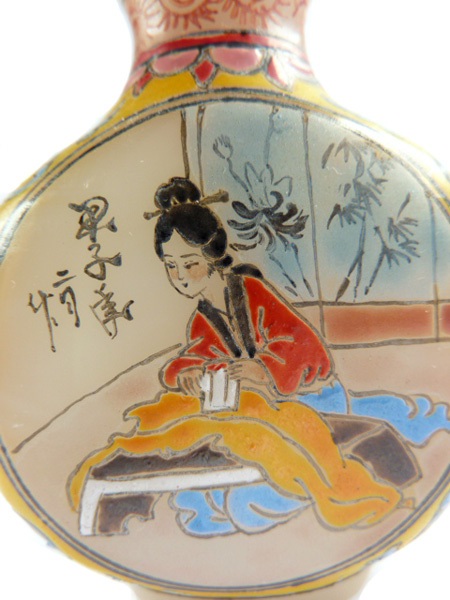 She calls herself an Impulsive buyer of nice things and don't mind paying a pretty penny for it. They have raised enamels, unlike replicas which look well made but have mostly flat paints. 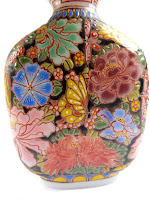 Please contact me with your offer at: chibilemon(at)gmail.com with your country of residence if you are interested. 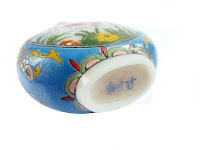 I am currently not putting this on my main site as prices are too varied on Guyuexuan pieces from four figure to six figure sums, with some 20th century Guyuexuan going for four figure sums. 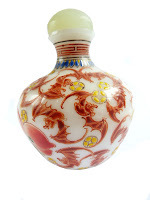 I consider all reasonable offers and do have a reserve price in mind, but may close the deal to whoever asks first. 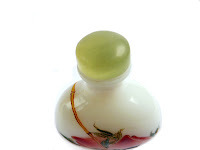 I am willing to expedite worldwide via Speedpost Standard (details here) for free on bottles depending on price. 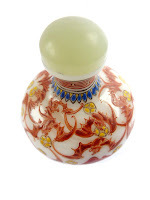 As sales for the bottles are going into retirement, no refunds are offered so please consider carefully and ask all questions before purchasing. I accept Paypal (international) and bank transfer (for Singapore residents) in preferably Singapore dollars, you can make your offer in USD as well. 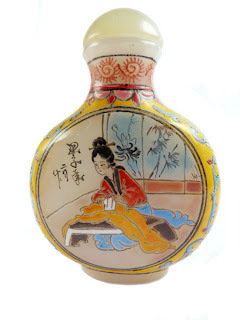 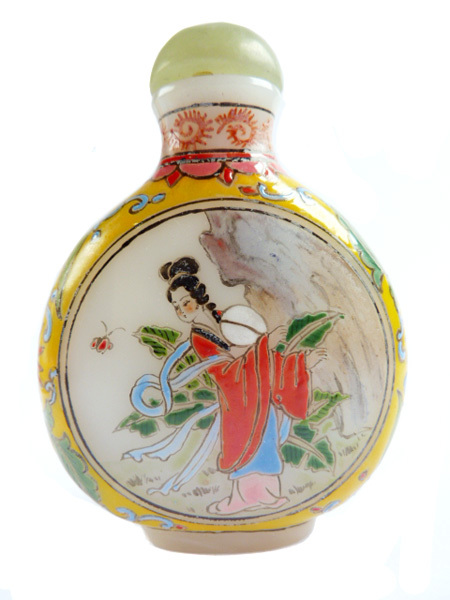 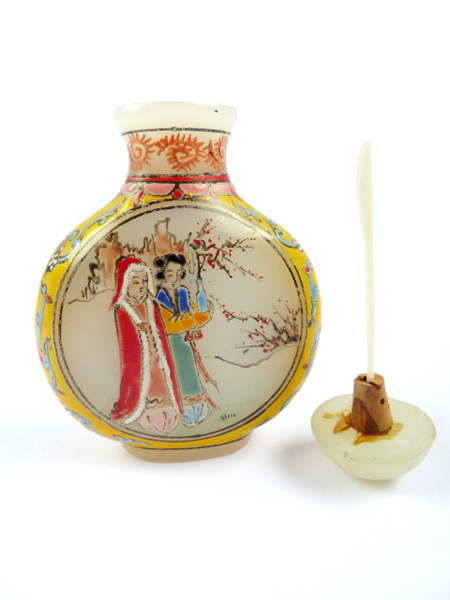 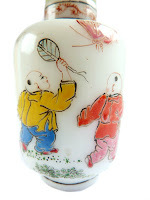 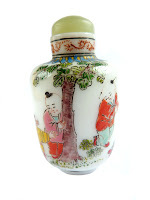 Antique GuYueXuan glass snuff bottle featuring Baoqin from Hong Lou Meng 'A Dream of Red Mansions'. 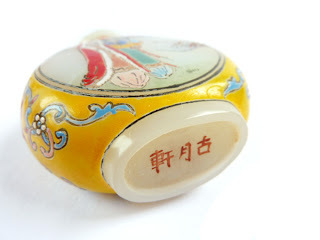 Marked 《古月軒》as well as the artist's name although I cannot decipher the calligraphy. 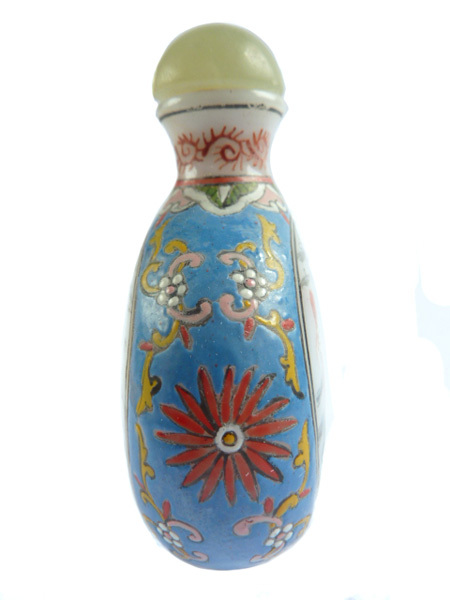 It is in very good condition, has some slight wear on the painted details from age, especially on the black lines. 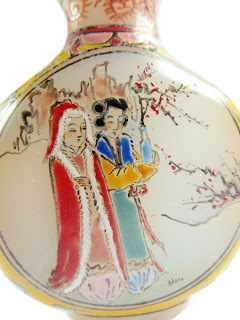 It shows the famous scene of Xue Baoqin collecting a branch of red plum blossoms in the snow with one of her maids. The other side is probably still Baoqin, in a room on a table. 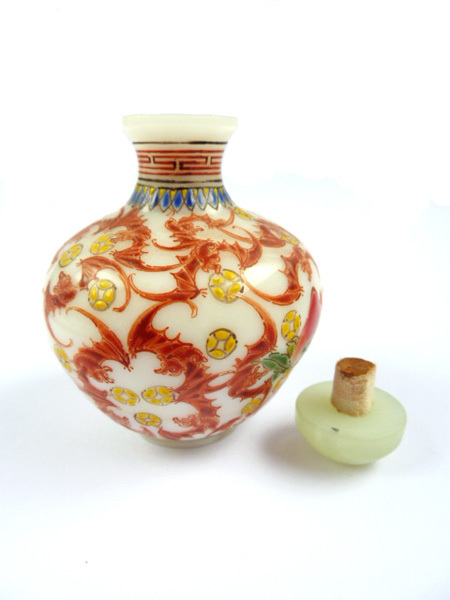 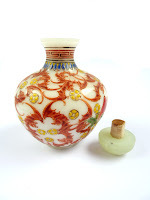 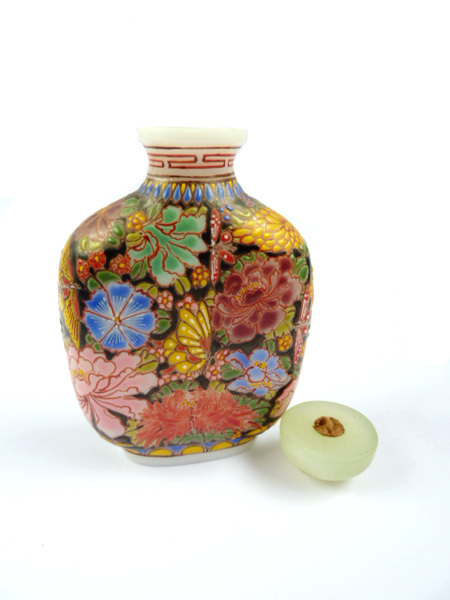 Nice heavy white glass base with raised handpainted enamels, the sides are yellow with red, blue and pink floral motifs. The stopper is a pale jade - almost white, it has natural inclusions within. This could be from the 1800s-1900s, it was purchased from a Beijing antique store in the 1970s-1980s. 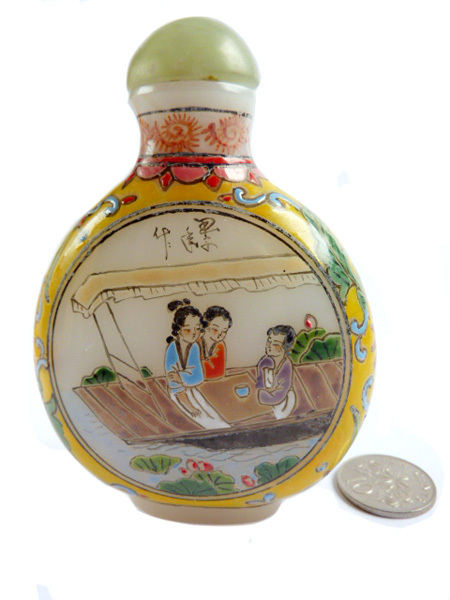 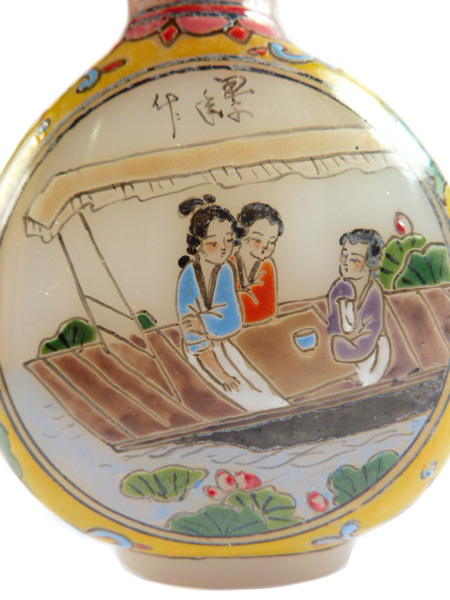 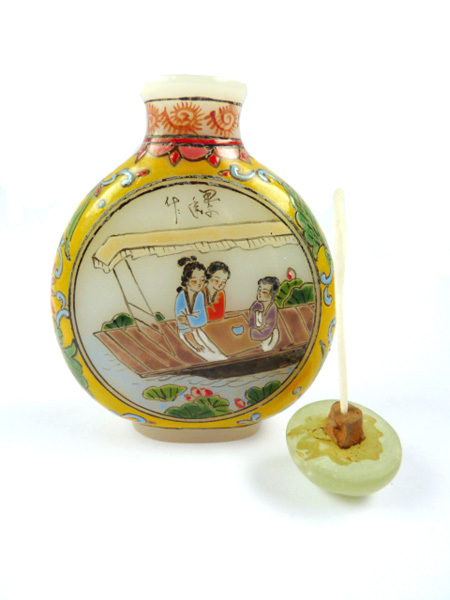 Antique GuYueXuan snuff bottle featuring a lady in red and a boat scene with 3 ladies. It is marked 《古月軒》and has the artist's name but I cannot decipher the calligraphy. In very good condition, there is some wear on the black lines from age. Exquisite bottle, large sized snuff bottle and weighs heavy. 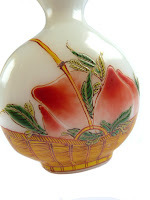 The details are handpainted and has raised enamel upon the whtie glass. 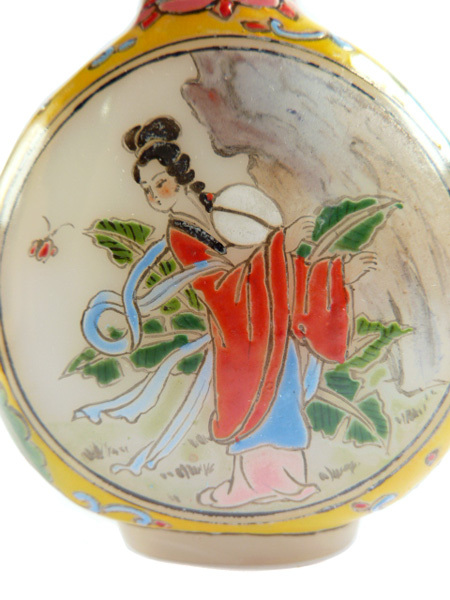 Not too sure what scene this is from, it is possible it is a lady from Hong Lou Meng 'A Dream of Red Mansions', perhaps Xue Baochai chasing a butterfly. 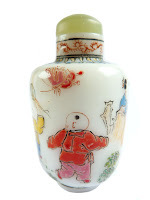 I am guessing this as my other Hong Lou Meng GuYueXuan bottle has the same artist signature. 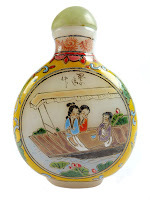 The other side of the bottle would be the ladies having a ride in their boat. The sides are yellow with a red chrysanthemum and leaf motif designs. 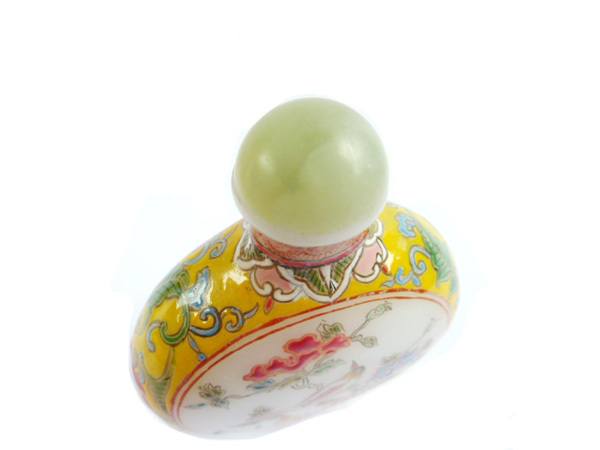 Jade stopper has natural pitting and inclusions. 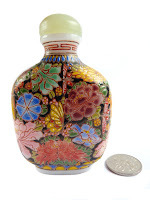 This will be a lovely addition to a snuff bottle collection! 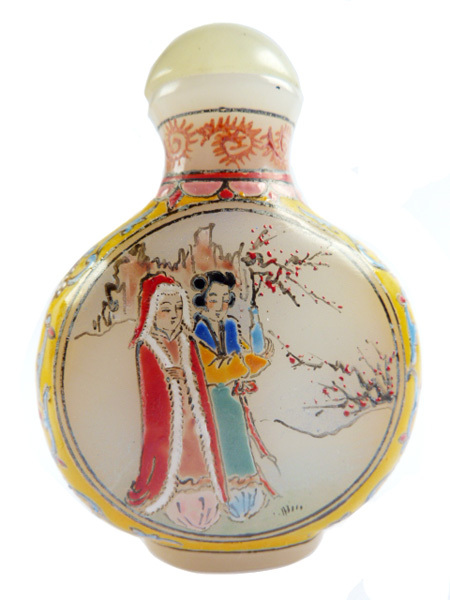 This is probably from the 1800s-1900s, it was purchased from a Beijing antique store in the 1970s-1980s. 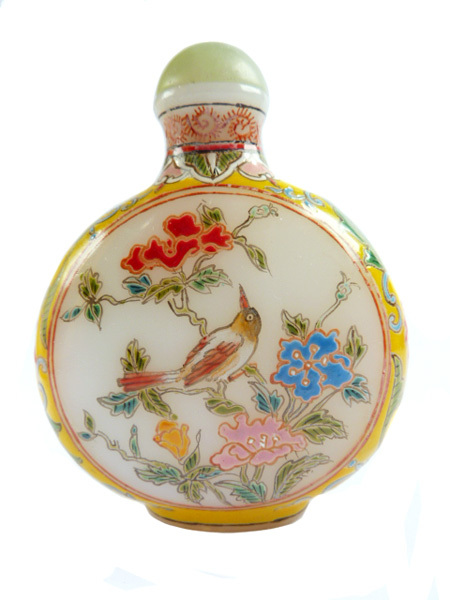 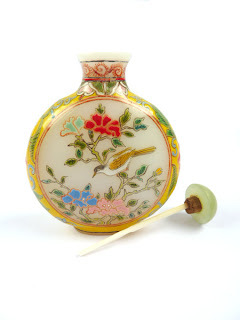 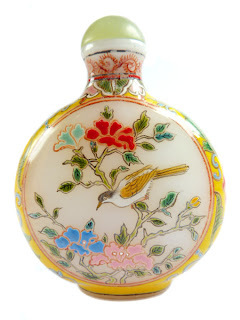 Antique GuYueXuan glas snuff bottle featuring a bird amongst flowers, the design is different on both sides. Beautiful larger sized snuff bottle, weighs heavy and excellent quality. Exquisite piece, has some wear on the painted details, some on the red lines from age. 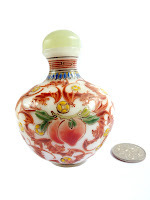 The base is a white glass with raised enamel details, handpainted. 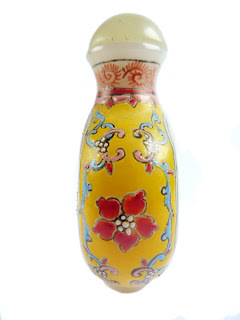 There have been fakes with similar designs around but this is one is superior in workmanship: the colours are more vivid, have dimension and is a deeper yellow. 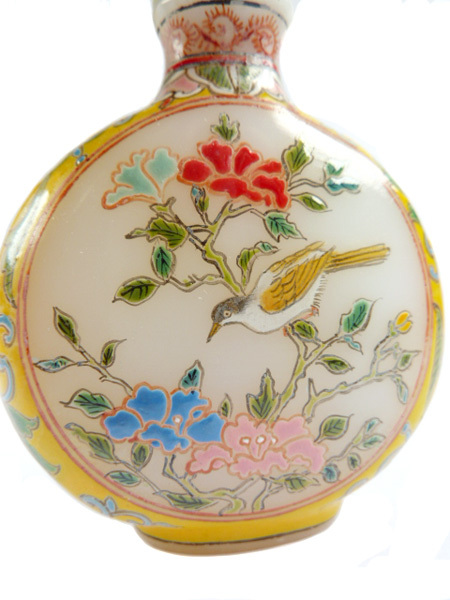 There is a brown bird amongst a branch with red, blue, pink, mint green and yellow flowers. The sides are yellow, with a red peony and leaf motif designs. 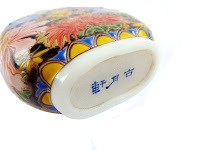 It is marked 《古月軒》. 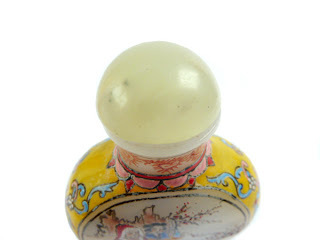 Comes with a green jade stopper. This could be from the 1800s-1900s, it was purchased from a Beijing antique store in the 1970s-1980s. 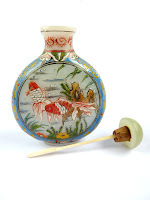 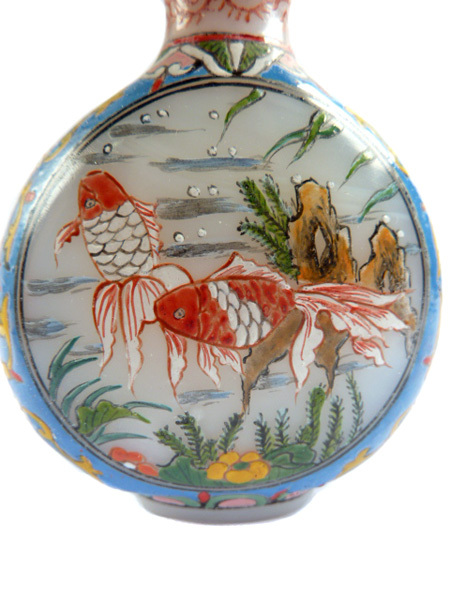 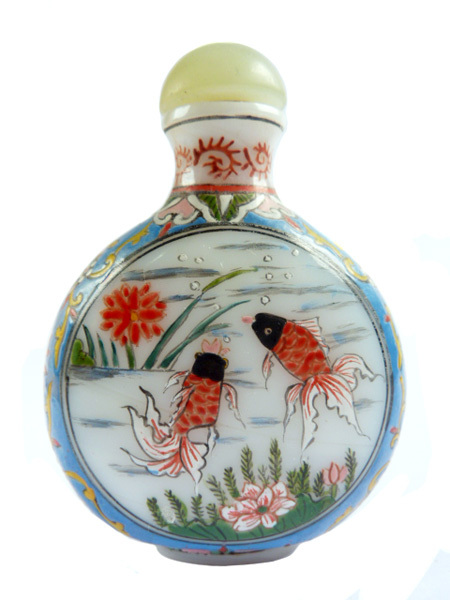 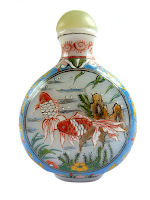 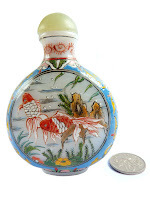 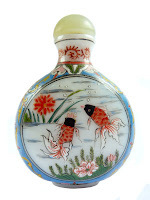 Antique GuYueXuan snuff bottle featuring goldfishes. 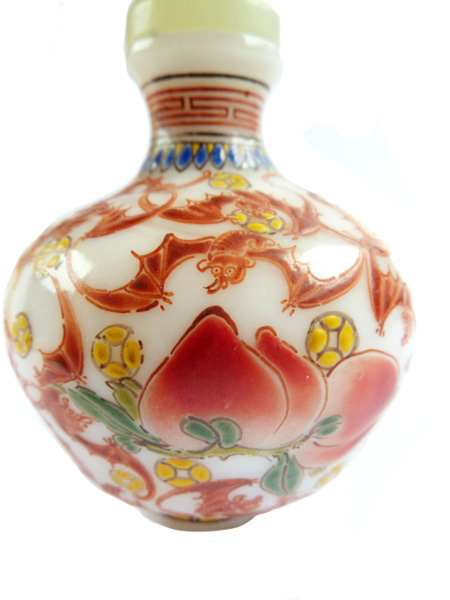 It is in excellent condition, although some of the black lines have wear from age. Exquisite handpainted details, with raised enamel on a heavy white glass base. 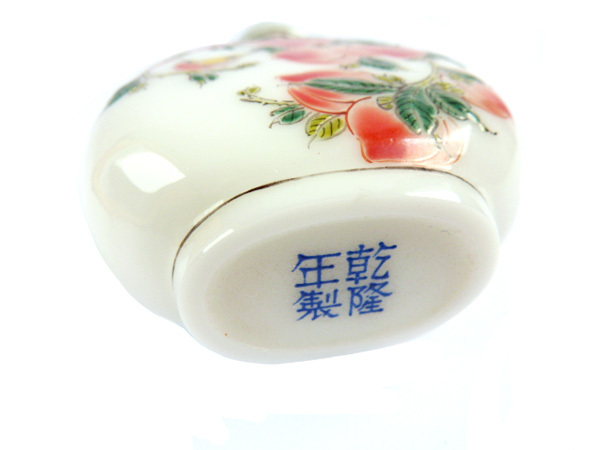 It is marked 《古月軒》 on the bottom. One side shows a pair of chinese goldfishes with a gradient colour, there is an artificial rock and flowers and aquatic plants in the background. 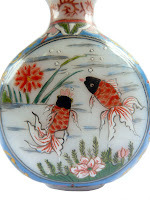 The other side shows a pair of goldfishes with black heads, with lotus flowers and aquatic plants in the background. 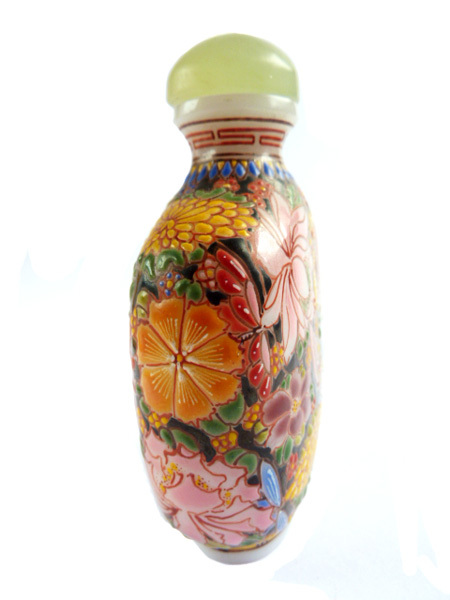 Sides are blue with red chrysanthemums and yellow, pink motifs. 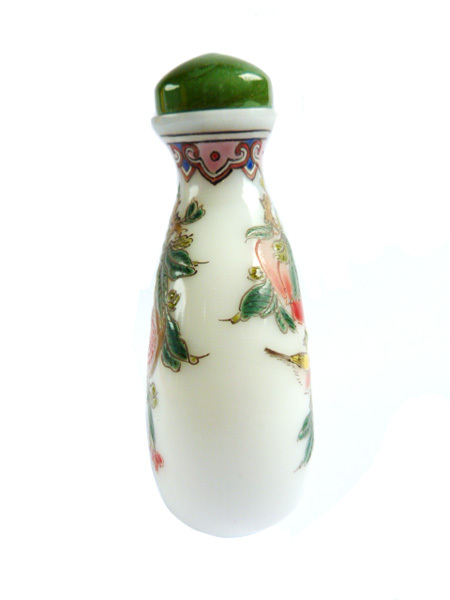 Comes with a jade stopper. This could be from the 1800s-1900s, it was purchased from a Beijing antique store in the 1970s-1980s. 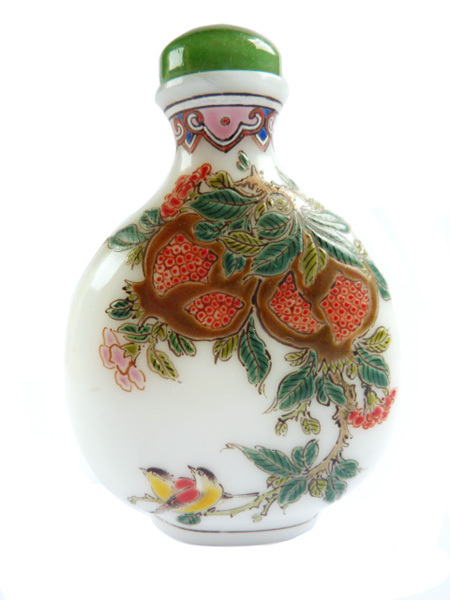 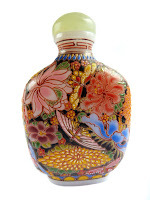 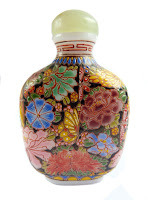 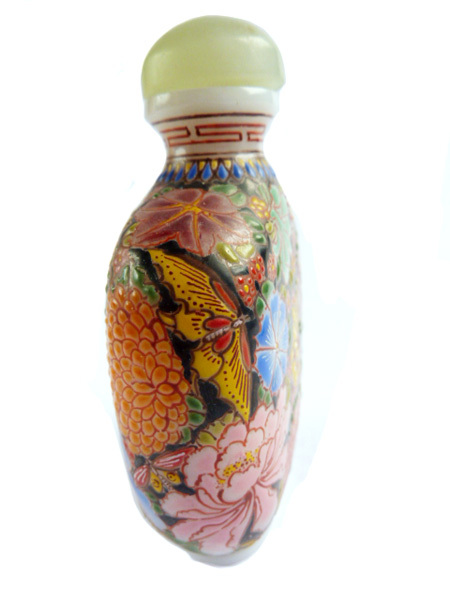 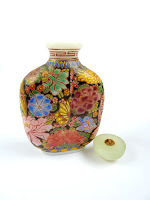 Antique GuYueXuan snuff bottle with incredible floral and butterflies enamel. It is marked 《古月軒》 on the base. 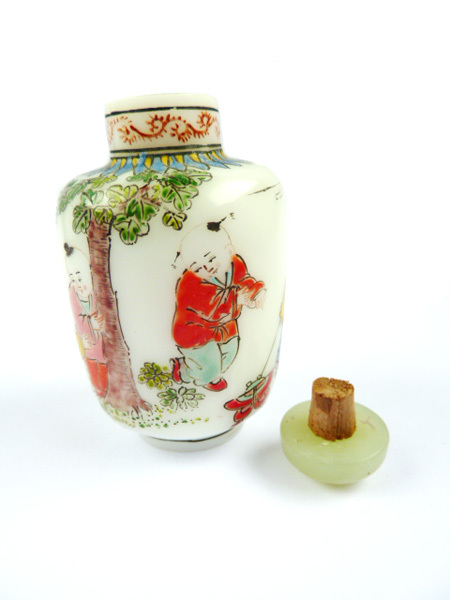 It is in excellent condition, but the jade stopper is missing the wooden stopper as it has rotted off from age, it is now a stubble left. Heavy glass with white base, and handpainted raised enamel details, the background is black and is entirely filled with different flowers like chrysanthemums, peonies, lotus, morning glories in a multitude of vivid colours, there are butterflies fluttering about. 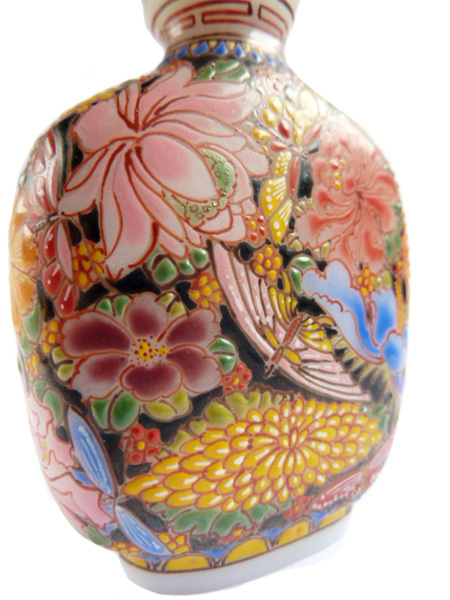 I have photographed it at an angle to show the raised details, they have a bumpy appearance and unlike replicas which are mostly flat and not so neatly painted. This is a stunning piece for any snuff bottle collection! 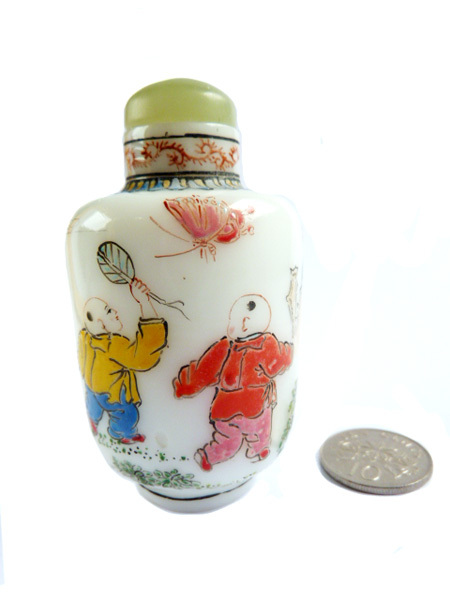 Probably from the 1800s-1900s, it was purchased from a Beijing antique store in the 1970s-1980s. 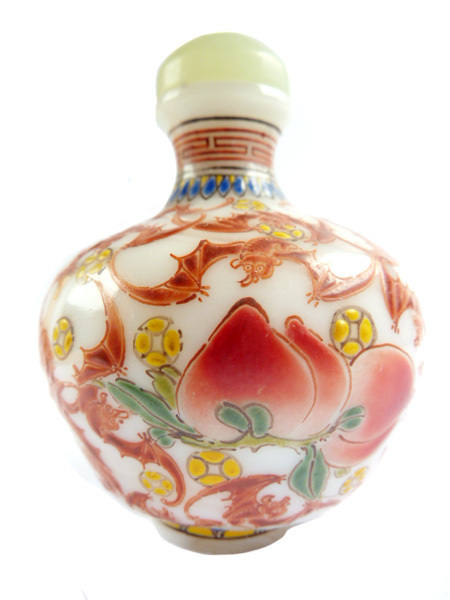 Antique Qing Dynasty QianLong snuff bottle featuring a host of bats and peaches. It is in excellent condition. 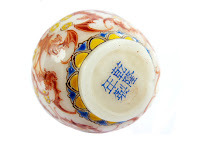 Marked 《乾隆年製》Qian Long Era. 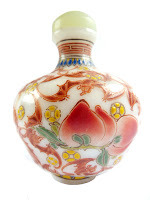 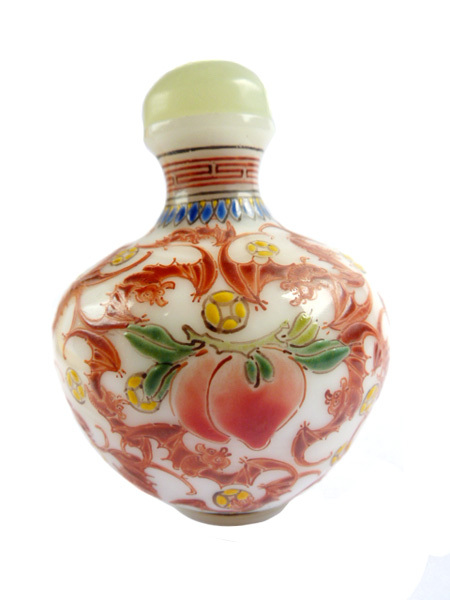 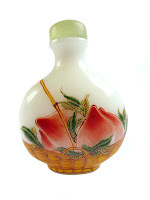 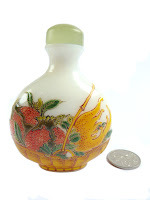 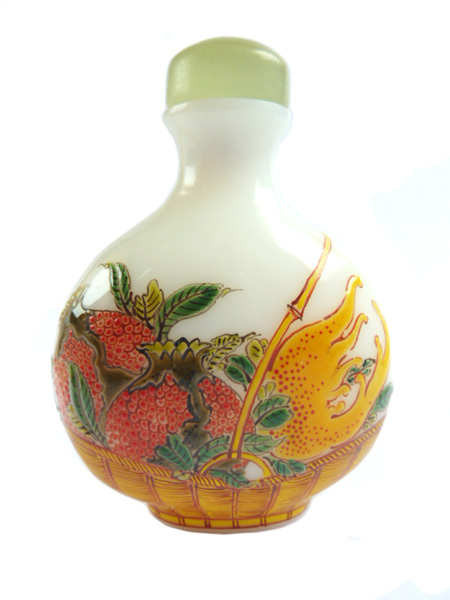 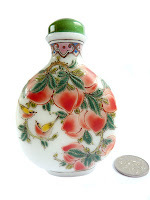 The bottle is handpainted and highly detailed and precise, nice heavy glass in white and filled with a lot of brown bats forming a pattern, and what appears to be gold coins, and red-pink peaches on two sides of the bottle. 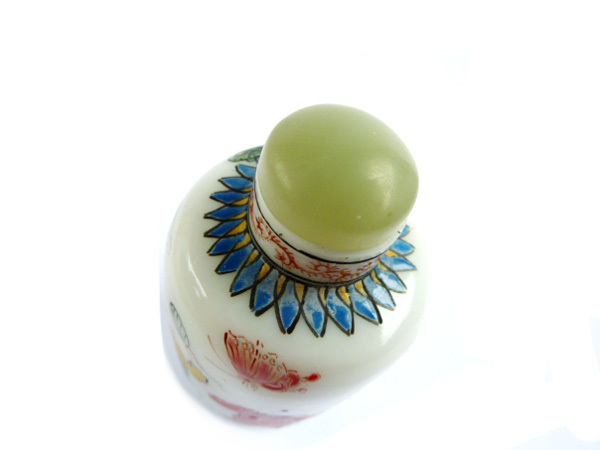 Raised enamel details, it comes with a jade stopper. 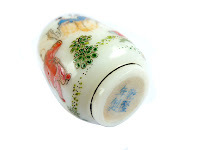 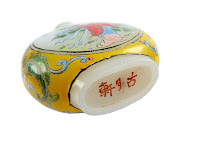 Perfect piece for your snuff bottle collection, in GuYueXuan style, it is likely 1800s. Antique Qing Dynasty Qianlong snuff bottle featuring 6 children playing, marked 《乾隆年製》Qianlong Nianzhi, in very good-excellent condition, there is very slight fading on the brown lines and blue paint on the top design. 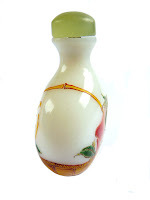 Nice heavy white glass, there is a slight pit on the glass - not a chip but from manufacturing. Handpainted enamel, the children are playing hide-and-seek and a pair is chasing butterflies and flying a kite. 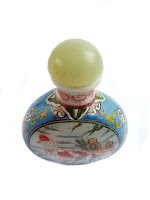 Comes with a jade stopper. It could be up to 1800s. 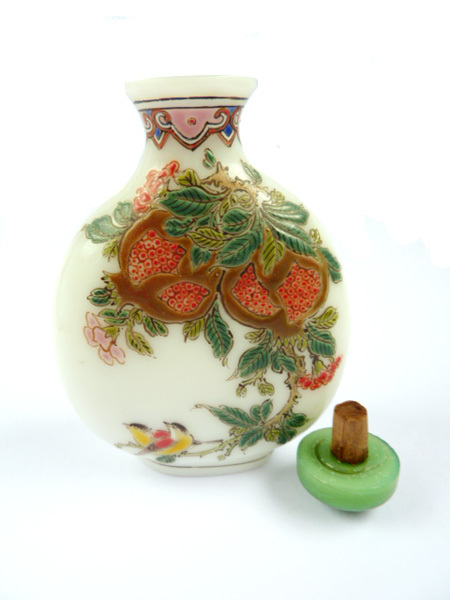 Antique Qing Dynasty Qianlong snuff bottle featuring a basket of fruits, in excellent condition, marked 《乾隆年製》. 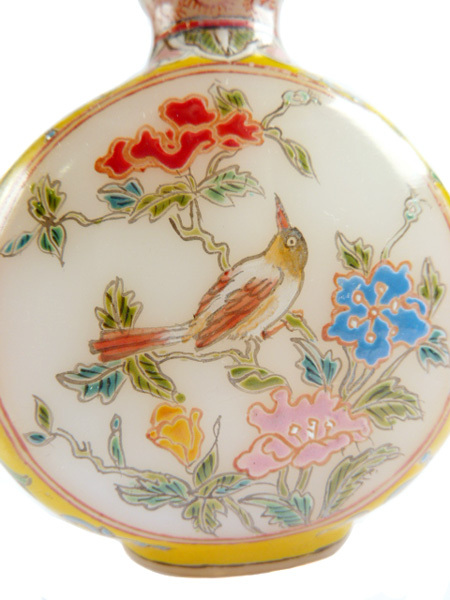 Exquisite piece made of heavy glass, with handpainted raised enamel details with bright vivid colours, very neat, very detailed. I have tried to photograph it at an angle to show the bumpiness of the seeds. The fruits include pomegranates and Buddha's hand fruit on one side, and peaches on the other side. Comes with a jade stopper. 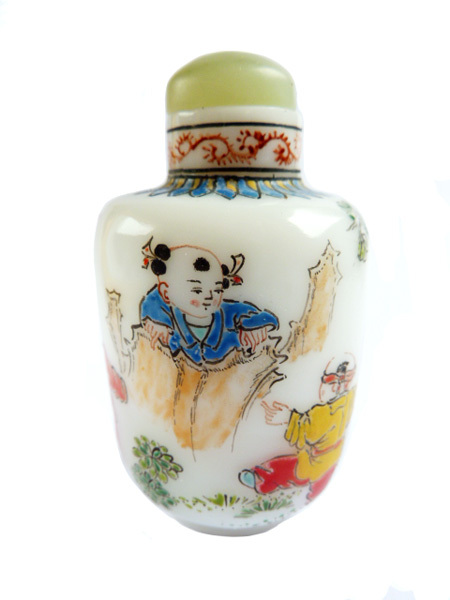 This is probably 1800s, and quality is like Guyuexuan's pieces, style is also like Guyuexuan. There are cheap replicas around so this is probably a popular design. If you compare the fakes with this one, well there is no comparison...! Fabulous addition to any chinese or snuff bottle collection. 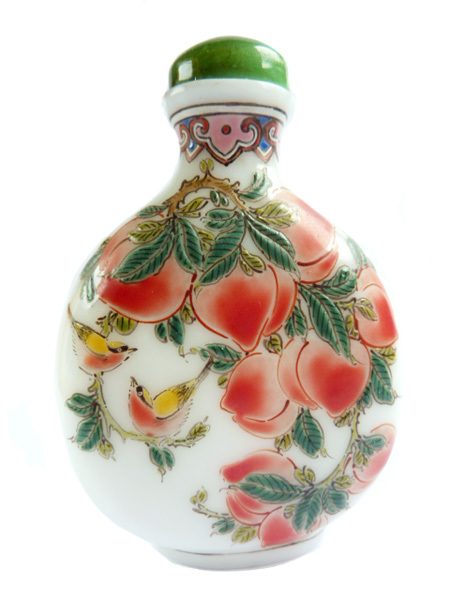 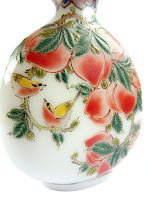 Antique Qing Dynasty Qianlong glass snuff bottle featuring peaches and pomegranates and a pair of birds. Marked 《乾隆年製》and in excellent condition, the details are exquisitely handpainted with raised enamels. The stopper is probably a replacement one, looks to be made of glass. The painting shows a highly detailed branch of graduated red peaches and a pairs of birds. 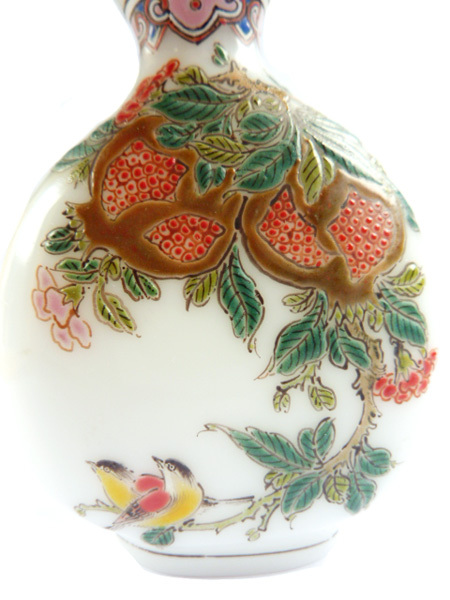 The other side shows an open pomegranate branch with another pair of birds, the enamels are raised and have a bumpy texture! 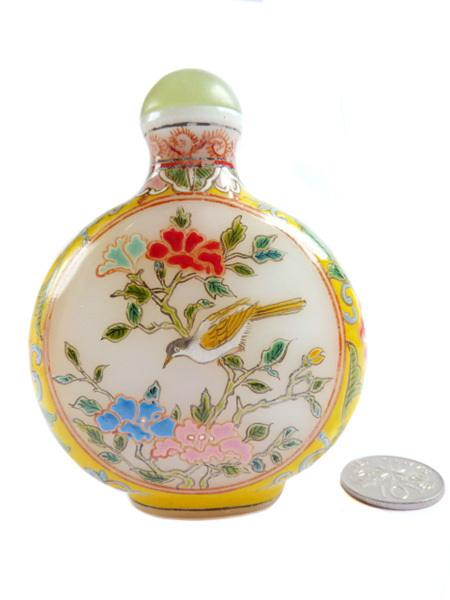 Nice heavy glass, the quality is like Guyuexuan pieces. 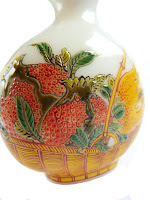 Dated possibly 1800s.